From strumming a few chords that inspire, to the rhythm of my feet walking along the street or the beat of a door banging in the wind, to lines that rise up in an overwhelming pull of emotion inspired by a moment, a conversation, a look, a feeling and hastily jotting thoughts down on paper or in my phone. It can be mapping out a concept like the outline of a script, or the empathetic seeing through someone else’s eyes - letting yourself disappear into their story, their moment, their feelings. It all differs as to how a song comes to life. Some songs show up suddenly and know where they want to go, some are more conscious than subliminal and are intellectually formed on a spark, while others grow painfully slow line by line by line over weeks, months, years and yet other songs are found when you step away from them. I find that many of my songs are built in a repetitive process of playing, singing, listening and slipping into a space and flow. And then editing. I love editing. The crafting of a song. The calm resolve of having the pieces with the freedom of exploring those pieces to make it stronger, deeper. To make it whatever it calls to be. And on co-writing. It really depends on who you’re writing with. I've found that co-writing is usually a conscious in the moment doing, working back and forth, leaning into the energy of the person with you, feeling their flow and the collaborative building of what you both hear and what jumps in front or carries you away. And sometimes, if you're extremely lucky, you may find a cowriter who you have pure chemistry and knowing with. 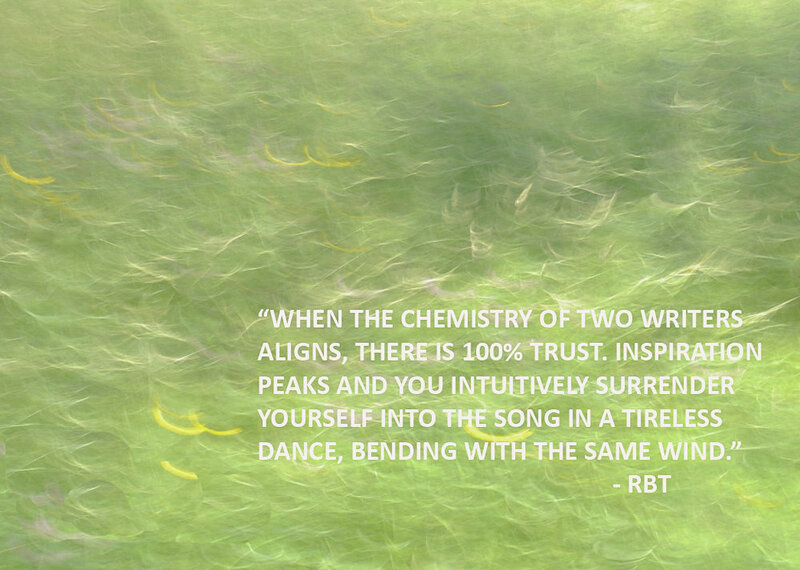 And when the chemistry of two writers aligns, there is 100% trust. Inspiration peaks and you intuitively surrender yourself into the song in a tireless dance, bending with the same wind. While not the norm, I can assure you it's pure magic when you find it.